Sts. 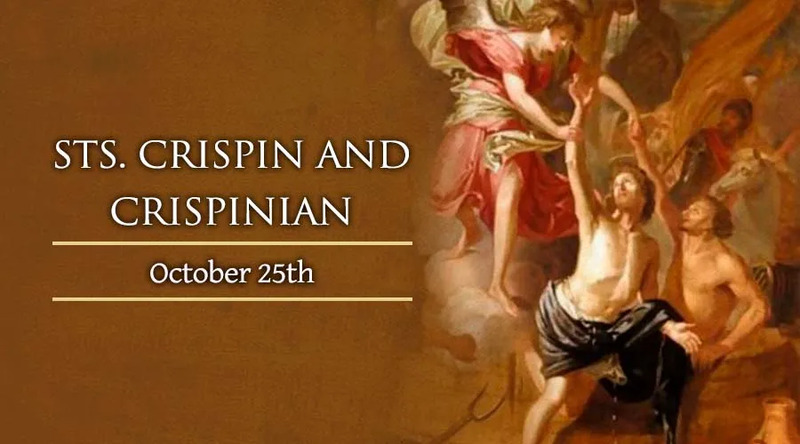 Crispin and Crispinian were brothers. Together, they evangelized Gaul in the middle of the third century. Working from Soissons, they preached the streets by day and made shoes by night. Their charity, piety, and contempt of material things impressed the locals and many were converted to Christianity. The brothers refused to yield to the persecutors of the Faith who wanted Crispin and Crispinian to apostatize. They were both beheaded in Rome ca. 286 A.D. They are the patrons of cobblers, glove makers, lace makers, lace workers, leather workers, saddle makers, saddlers, shoemakers, tanners, and weavers. A great church was built at Soissons in the 6th century in their honor.